Essential oils are all the rage these days with an increasing number of people turning to more natural based health care and cleansing products. 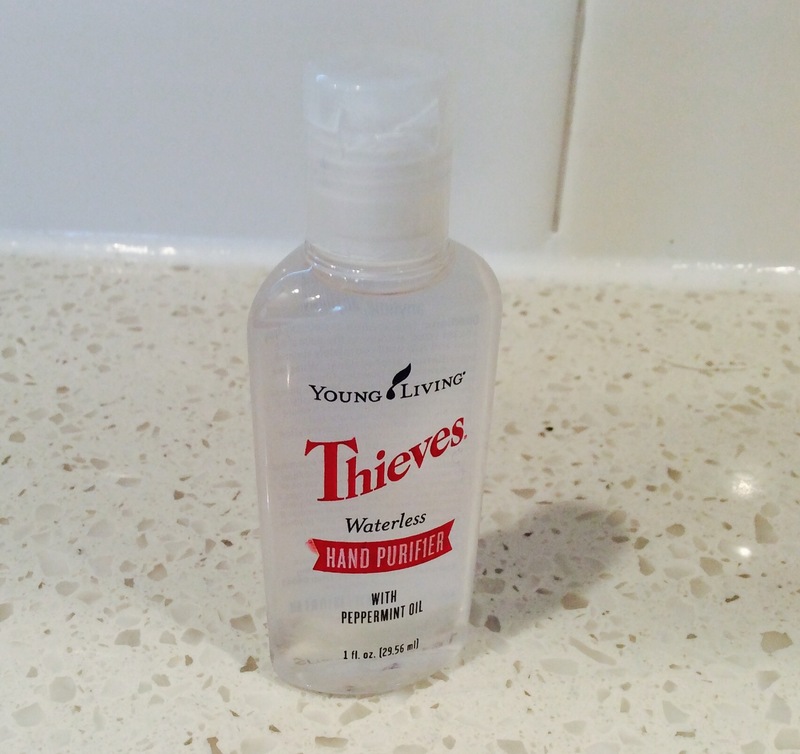 In fact, it was my goal to use less chemical laden products in my own home and I have fallen head over heels with some of Young Living’s great Thieves products. Over this past year I’ve dabbled in a few of these products and haven’t looked back. I prefer some more than others and even though I haven’t tried them all YET, over time I hope to add a few new products to my shopping cart. 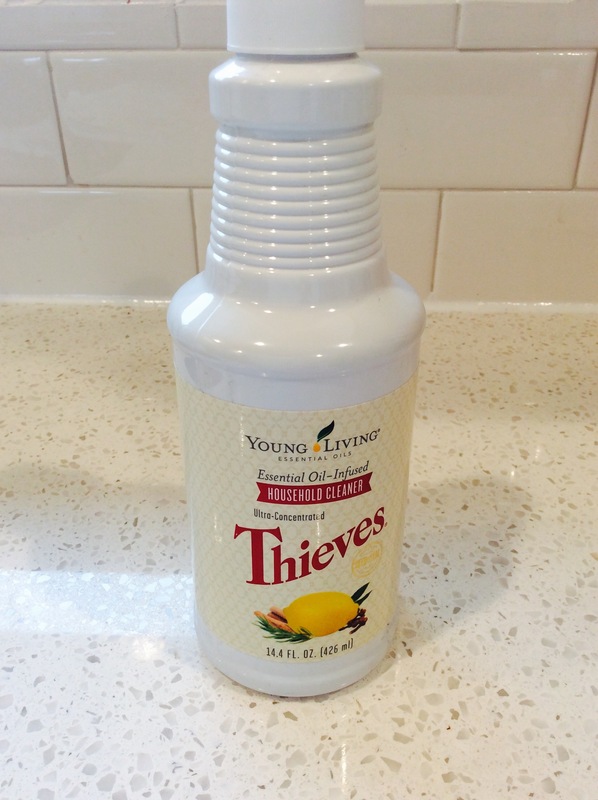 Young Living’s line of Thieves cleaners, personal care products and the all important essential oil all smell amazing to boot! 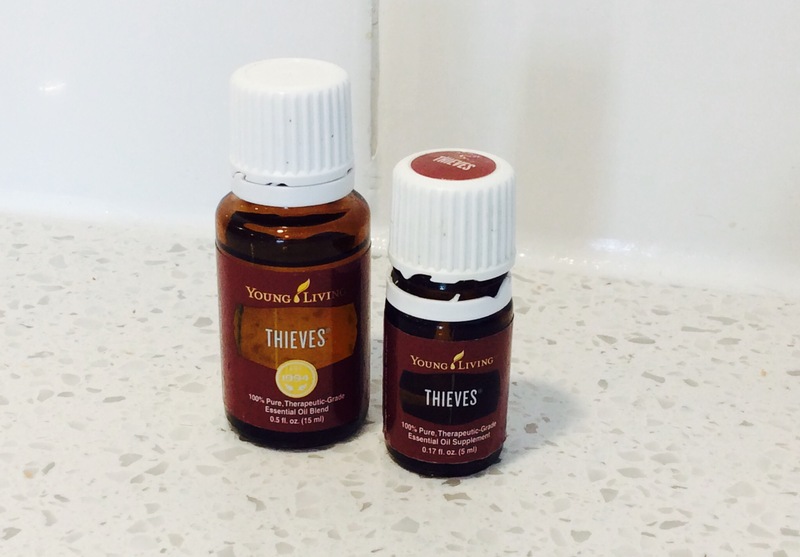 Thieves Essential Oil is a blend of 5 essential oils known to have great antiseptic properties to help us ward off those icky little germs that make us sick. In fact, it originates from it’s namesake in England where thieves would use it to guard themselves from the plague when they would steal from the sick or dying. It’s comprised of Cinnamon Bark, Clove, Lemon, Eucalyptus Radiata and Rosemary Cineol. My favorite way to use this oil is to diffuse it with Orange. It makes the winter feel warmer with the added aroma of the holiday season wafting through my house. It’s my go-to oil from October throughout the rest of the snowy months. When I first tried this product I was in love with the smell immediately. It echos the scent of Thieves essential oil without being overpoweringly strong. The concentrate is easily diluted to suit your specific cleaning needs. This one 14oz bottle can create a minimum of 15 bottles of heavy degreaser up to 100 bottles of glass cleaner strength product. In my home I keep a spray bottle mixed at a ratio of 30-50 parts water to 1 part cleaning concentrate. I use this for my counters, stove top and general cleaning uses. I’ve even used the Young Living Household Cleaner in combination with water and olive oil to clean and condition my hardwood floors and furniture. This one small bottle will last me about 6 months! The cleaning power is impressive but the best part…it’s not loaded down with a bazillion chemicals. It is a plant-based cleaner that is eco friendly. I wish I had this when my son was young and crawling around on the floors! I’m a sucker for the convenience of using my dishwasher but I always had issues with detergent residue. I disliked the fact that my water glass was cloudy and I knew every sip didn’t contain just water but a hint of whatever detergent I was using at the time. At first, I admit, I was doubtful it would work well because it was a natural product as well as a powder. Boy was I wrong. Load after load my glasses were always clean, spot free and film free. One tiny scoop was all it took to make everything sparkle. The powder contains no synthetic surfactants, dyes, phosphates or artificial fragrances. I love this product so much, I will be ordering it every month from now on. The dish liquid was nice with the same Thieves and citrus scent as the dishwasher powder. I can’t say a bad word about the product but it’s very reminiscent of my own mixture made with Full Circle Free & Clear dish detergent and a few drops of Thieves and Lemon essential oil. If you don’t want to go through the trouble of making your own essential oil infused dish soap, Young Living’s Dish Soap is a great, environmentally friendly option. It makes enough suds to satisfy my husband’s needs but its natural enough to make me happy. Hand sanitizer is not one of those things I use on a regular basis so for me this was a hit or miss product. This little gem was part of an order bonus I received and I was delightfully pleased with it. It’s a great hand cleansing option for the purse when there’s no time to wash your hands on the go. While the product does not necessarily carry the signature Thieves aroma, the Peppermint essential oil lends a very ‘candy cane’ essence to the purifier. It doesn’t leave any grimy afterfeel which I like and my hands are not dried out after using it. Again, it’s another great product from Young Living. There are 3 different types of Young Living toothpastes I’ve tried over this past year. One is by far my favorite but what I might like you may not and so on. So here goes. 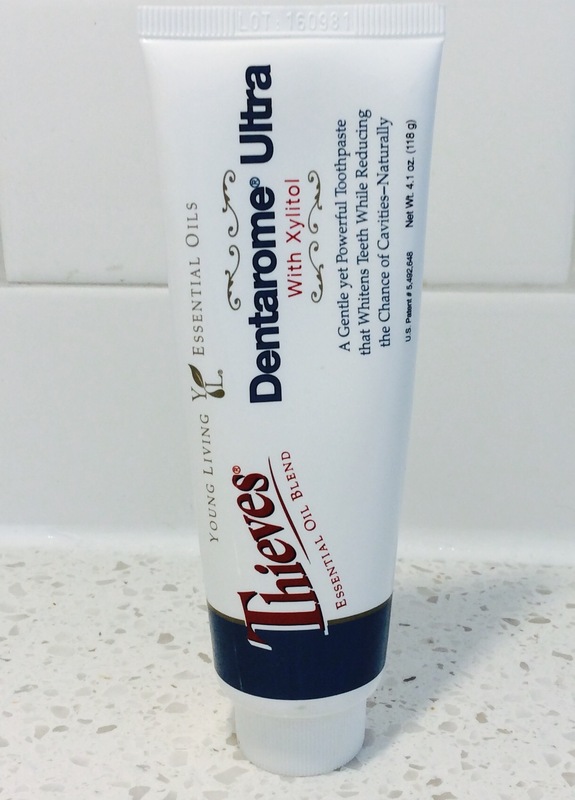 This toothpaste was my first step into Young Living’s world of tooth care. It honestly was much like walking into a foreign world when I placed my Aromabrite loaded brush into my mouth. The silky feel of this paste was very reminiscent of using solidified coconut oil. While it cleaned well and tasted fine, I really didn’t feel as though it did what I wanted a toothpaste to do. It was almost as if the paste melted and slid off the tooth’s surface. This would be a great product for young adults or those with sensitivity to the burning coolness of most minty toothpastes. I am currently using this toothpaste and I have to say it is a step up from Aromabrite. Not only did it have more of a minty profile, it clung to my teeth. Actually, it coated my entire mouth and tongue as if I had just chewed on a chalky Tums or Rolaid. For cleaning purposes it works, it’s pleasant tasting (not too minty) but make sure you check your face in the mirror before walking away. Chances are you’ll have to scrub some white slobber off your lips. This one, by far, is my favorite. If you took Aromabrite and mixed in a little Arm and Hammer then added extra Thieves essential oil this would be the love child. 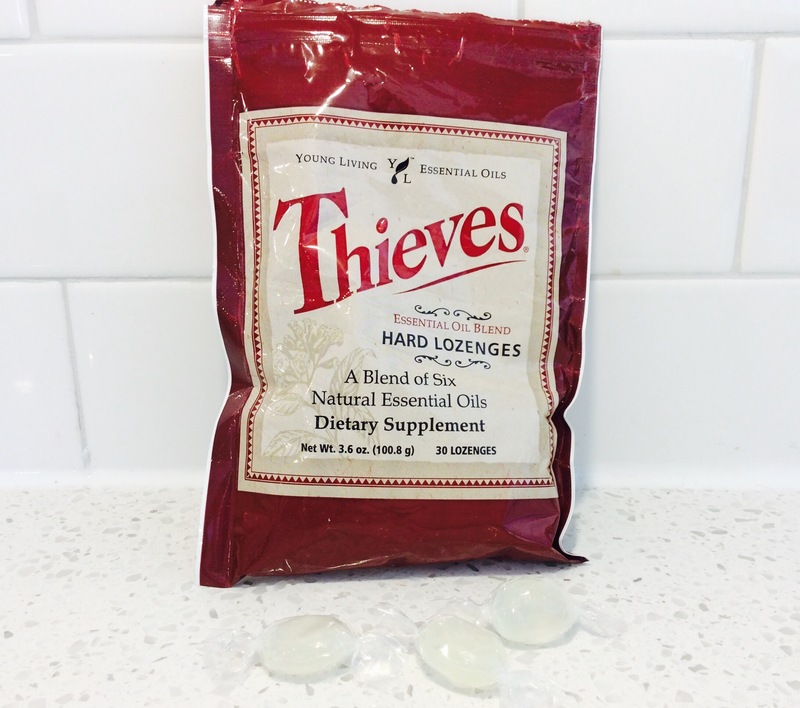 Lots of Thieves flavor in this one so watch out for those with sensitive mouths. The cleaning power is ah-maz-ing! Once I got used to the baking soda taste I knew this was the toothpaste I’d be reordering again as soon as it was back in stock. I had ordered these a while ago to use as sore throat drops. The clove in the Thieves really does help reduce painful irritation of the throat or even a mouth sore. Unfortunately, I personally find these lozenges to be strong…strong enough I didn’t want to pop in another one an hour later. I can be finicky that way with any hard candy type product – strange I know. They do taste good with delightful sweetness from Stevia. 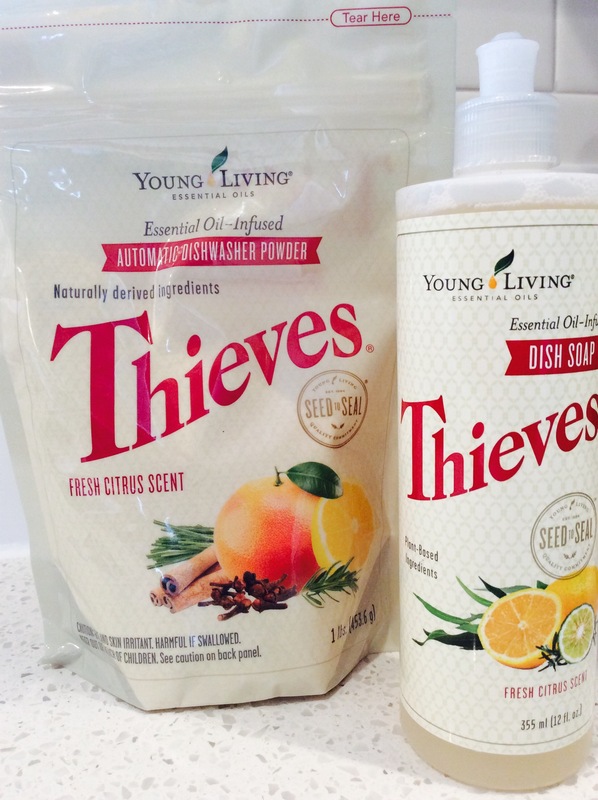 At this point there are a few more Thieves products I look forward to trying such as Thieves Mints and Thieves Laundry Soap. The latter will have to wait for warmer weather but for now I will be sure to stock up on my new favorite thing – Thieves Automatic Dishwasher Powder! ThredUP Review #1 & Discount Link!